How did I manage to miss the entire (brief) life of 7-Up Gold? Apparently it was a cinnamony (!) ginger version of 7-Up, that was born and died quckly back in 1988. Thanks for the link, Jeff! I love failed food products. I remember that stuff! In fact, I rather liked it. Ah, the 80s. The Golden Age of "let's take a tried and true formula and TRY TO MAKE IT BETTER." Sometimes they were fun as one-off novelties, but twenty years later, how many kooky B-side flavors of our favorite sodas have stuck around? 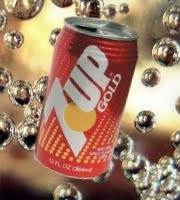 I actually LOVED 7UP Gold and am still somewhat vainly hoping it will make a come back.